Is it just me or is anyone else jonesing for summer and the warm weather that accompanies!? Although it is officially Spring, I am still waiting for the weather to catch up. There have been a few beautiful warm days here and there recently, and yet I woke up to snow on Monday. Welcome to New England in March! You just never know. This past weekend I was up visiting a friend up on the North Shore of Mass, which naturally involved a little bit of shopping. If you are ever in the area, I highly recommend making a stop to MarketStreet in Lynnfield. The shopping is to die for - think J.Crew, Lululemon, Sephora, Vineyard Vines - the list goes on. Not to mention, there are a few great places to wine and dine (The fresca margarita at Temazcal.. YUM). You could easily make a day out of it. I definitely recommend checking it out! 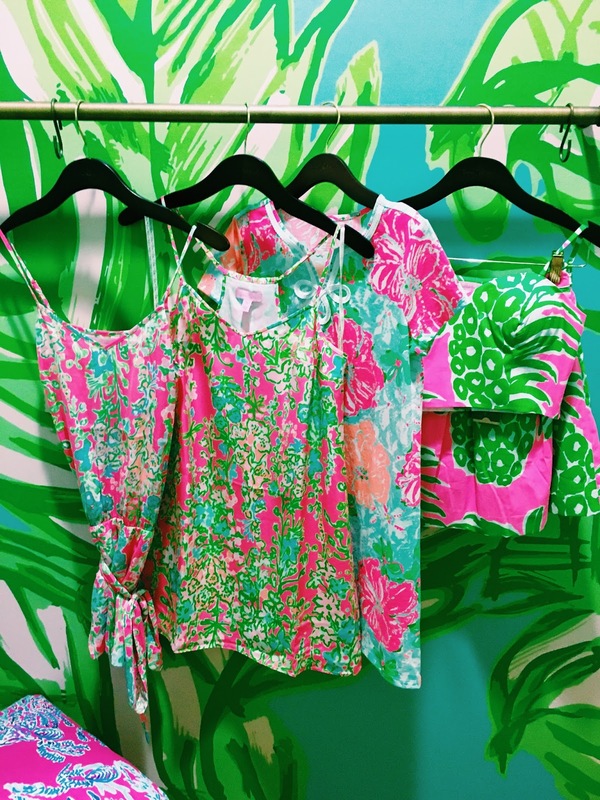 While shopping my friend and I found ourselves in Pink Parkway, a Lilly Pulitzer signature store, and let me tell you, walking in there was like stepping into mid-July. The bright colors and adventurous prints scream summertime to me, and although we are still a few months out, I couldn't help but try on a few new arrivals. As you can see from the above photo, I love love love the southern charm print. I grabbed it in both the romper and the slip dress, and honestly it's still up in the air as to which one I liked better. 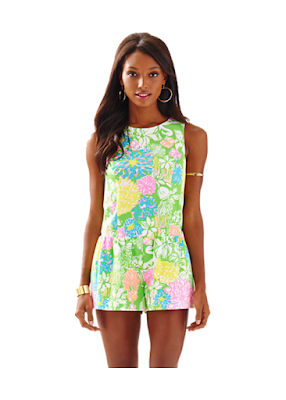 The romper is super fun, but you also can never go wrong with a silk racerback dress. Can we just take a second to talk about the parfait set in pink flamenco!? SO fun. I have been seeing it everywhere and just had to give it a go. Unfortunately the size I tried on was a little bit big, and the store was out of the size down, otherwise it would have been perfect! My friend tried it on too, and it looked great! 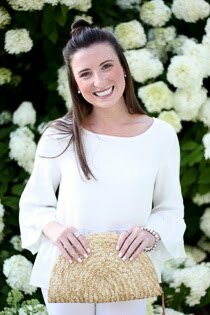 I know it's a new style to Lilly, and the crop top makes it a little more out there than your normal Lilly styles, but I think it is totally worth checking out and absolutely adorable! If they had it in my size, it would have totally been mine. The items I tried on are just a few things that have caught my eye lately. Lilly has so many prints and styles that I am loving this season. I mean when do they ever not? Check out some of my favorites below! 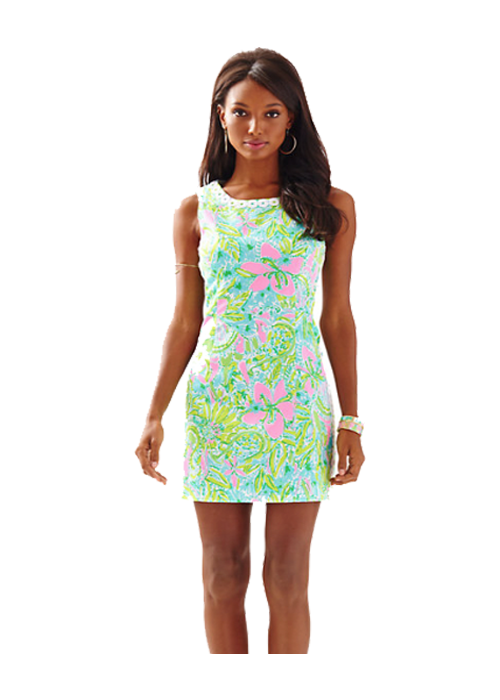 Keep dreaming of summer in Lilly until the warm weather rolls around. I sure know I am. Enjoy! Did anyone else notice the last romper there is the 'Gretch' romper? I promise I didn't make that one up! I think I need it just because of that alone..